When you go camping, you pretty much have to roast hot dogs and marshmallows over an open flame. What could be simpler than putting food on some sort of stick and lighting it on fire? Over the years, I’ve impaled food on coat hangers, stainless steel implements, whittled tree limbs, and welding rods. Now the FireFork aims to end those days of questionable cookware. A little plastic cap protects the FireFork’s tines from getting dull or dirty. Pop off the cap, flex the tines, and slide the FireFork over the mossiest piece of wood you can find — you’ll still have a hygienic little weenie roaster. The spring design allows you to fit it over a variety of sticks and easily slide it off for future use. It may well be the death of innocence around the campfire — or maybe I’m just jealous I never thought of it. 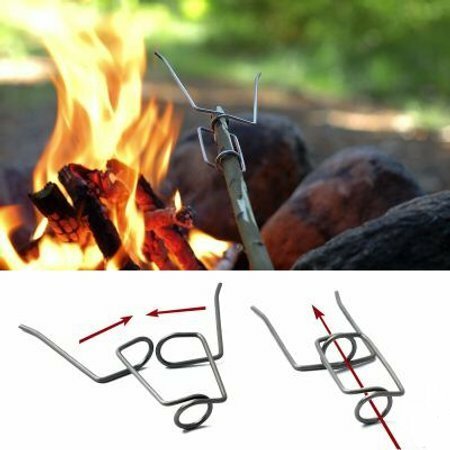 The FireFork sells for the backwoods price of $5 for one, $15 for four. Call me overly frugal, but at $5 apiece, I think I’ll whittle sticks. They’re free, and you don’t have to worry about forgetting them at the campsite. I think I’ll just make my own out of welding rod. A plastic cap to keep it clean? Isn’t that what fire is for?